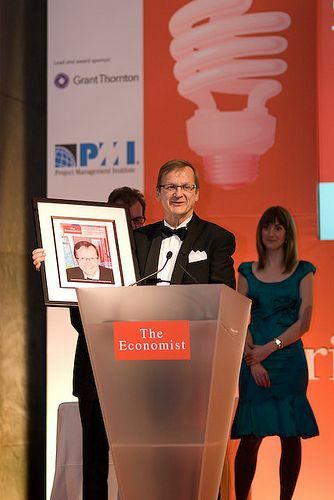 SMS innovator Matti Makkonen, received the The Economist’s Innovation Award for the Computing and Telecommunications Category. This year’s awards were presented in London last October 30th and 31st 2008. The Economist gives out Innovation Awards annually to recognize successful innovators in different categories. Mr. Makkonen is a Finnish engineer who is credited with inventing SMS, which allows short messages to be sent between mobile phones. He proposed the idea in the 1980s while working at Finland’s telecoms authority. Billions of text messages are now sent every day. Aside from text messaging, SMS has also been useful in a lot of ways. Many applications have been built around SMS that made it useful, not only in communications, but in other fields as well such as Mobile Banking, SMS voting, Infotext, and other SMS services. Bioscience: Martin Evans, director of the school of biosciences and professor of mammalian genetics at Cardiff University, for his work in stem-cell research and the development of ?knockout? mice. Business Process: Jimmy Wales of Wikipedia for the promotion of online public collaboration as a means of content development. Computing and Telecommunications: Matti Makkonen for the development of Short Message Service (SMS), or text messaging. Consumer Products and Services: Steve Chen and Chad Hurley of YouTube, for creating an easy way to share video. Energy and the Environment: Arthur Rosenfeld for his promotion of energy efficiency. No Boundaries: Sumio Iijima for the discovery of carbon nanotubes. Social and Economic Innovation: Bill Gates and Melinda Gates for developing of a philanthropic support platform. Corporate Innovation: Nokia for its ability to respond to social and technological trends while maintaining its position as the world’s largest handset-maker.